Parts and composition of tar-and-gravel, built-up, and flat roofing systems, with a helpful tar-and-gravel roof construction diagram. 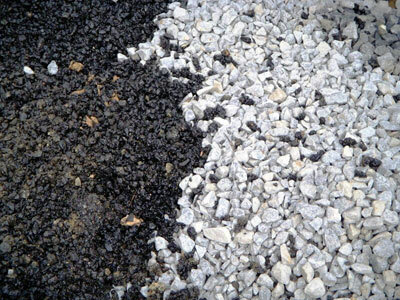 After a roof is “hot mopped” with asphalt, gravel is spread on top. 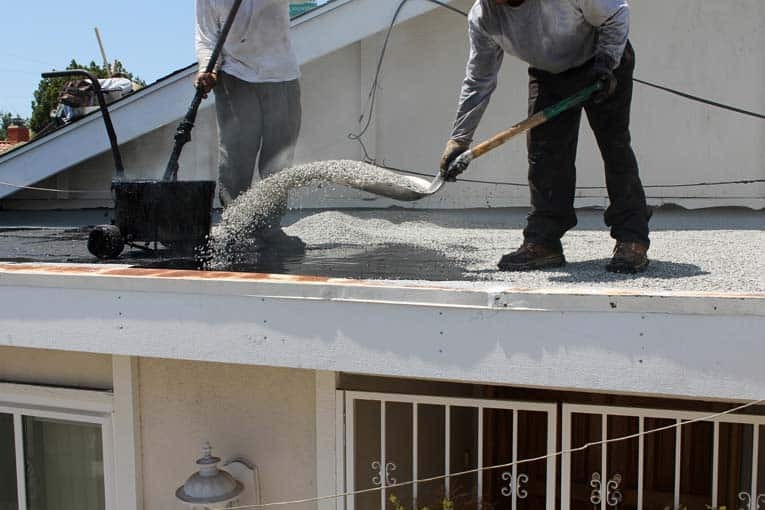 Most houses with flat or nearly-flat roofs are topped with built-up roofing, or “tar-and-gravel” roofing, made from fiberglass-based asphalt sheeting that is applied in layers, with hot bitumen mopped on between each layer. The surface is coated with bitumen and a layer of gravel or crushed rock to hold the roofing material down and minimize damage from the sun and from abrasion. The light-colored gravel also reflects the sun’s heat. Built-up roofs can last from 10 to 20 years, depending on the severity of the weather. Similar to built-up roofing is roofing made from a single layer of asphalt-impregnated material, called asphalt roll roofing. 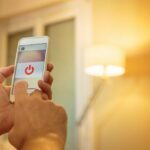 This is used more often on garages and outbuildings than on houses because of its relatively short life span (5 to 15 years). It is generally the least expensive roofing material available. Flat or almost-flat roofs can collect a tremendous amount of water, especially if their outlets or downspouts become plugged with leaves and debris. For this reason, they must be designed to seal against standing water that may pool on the roof. Ordinary roof shingles won’t seal-out standing water–they are designed to overlap one another and shed rain downward and so are intended for sloped roofs. “Flat” roofs (which usually have a very slight slope) utilize roofing that is completely sealed and therefore impervious to leaking. 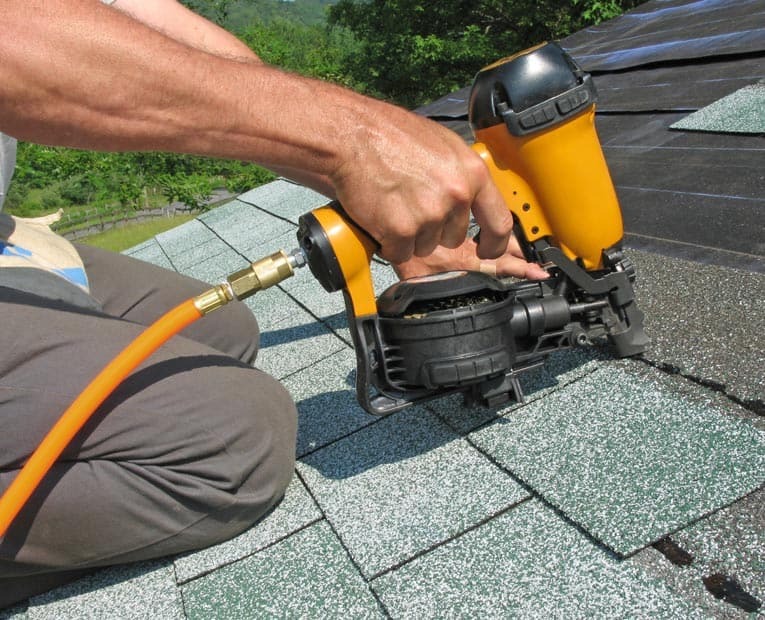 The standard roofing for this situation is built up from layers of hot tar and thick roofing felt and topped with a layer of gravel; this is called built-up roofing. Installing a built-up roof is not a DIY project; if you need a new or replacement built-up roof, contact a licensed built-up roofing contractor in your area.